A South Florida man says a Miami-Dade County garbage truck took more than his garbage when it went by his house last summer. Ignazio Amato said he was inside his home just after noon when he was startled by the loud noise he heard. "I looked through the window and I saw the garbage truck come front and down," Amato said. He said a Miami-Dade County garbage truck damaged his lawn and yanked out garden lighting. He called police and filed a report. Then he contacted the county and says he was told it would investigate and take care of the damages if they were at fault. But four months later, he got a letter from the county denying his claim. The letter said the "trucks are equipped with a GPS system" and the "findings show that the truck in question could not have done the damages" he was claiming. That's when Amato called the NBC 6 Investigators. 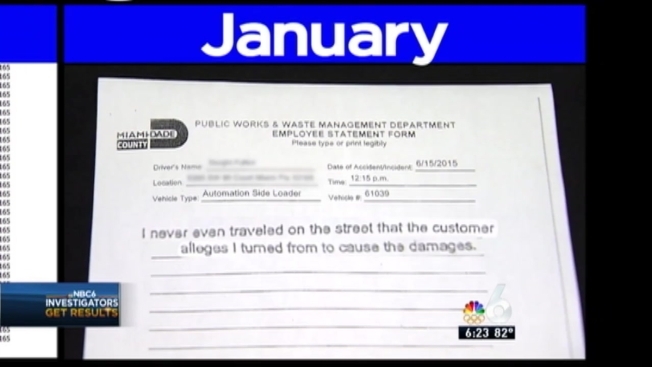 June 15, 2015: Amato claims a Miami-Dade garbage truck damaged his landscaping. November 9, 2015: Amato called NBC 6 Investigators. We made public records requests on Amato’s behalf. December 7, 2015: Received 3-1-1 log confirming Amato made a complaint. January 6, 2016: County sends its investigation report which included a signed letter from the garbage truck driver stating, "I never even traveled on the street that the customer alleges I turned from to cause the damages." The county also included a map with GPS coordinates to show that the truck passed by Amato's house at 10:26 a.m. not after noon when Amato said he saw the truck there. So, the NBC 6 Investigators request all GPS coordinates for the truck's route that day. February 19, 2016: County sends all GPS coordinates for the truck's route. The NBC 6 Investigators discovered the data showed the truck went by Amato's house once at 10:26 a.m. and again at 12:48 p.m. When the county saw the discrepancy, a spokesperson said they agreed to reconsider the case. April 14, 2016: Miami-Dade County sends a statement: "A subsequent review of our documentation revealed that there was a truck in the vicinity of Mr. Amato's residence later that afternoon. While the department (DSWM) cannot say conclusively that its truck created the damage, based on the above discrepancy, we would like to assist the homeowner…" "The department (DSWM) sincerely apologizes and regrets any inconvenience Mr. Amato has experienced." Amato said he got a phone call from the county. "Somebody from this office called me and they tell me, I'm sorry about this accident," he said. On April 22, 2016, Amato went to the county building to pick up a $1,250 check reimbursing him for the cost he incurred fixing his property.